Last night, acting on a tip from a member of the community regarding the sale of dangerous fireworks, Anaheim Police Crime Task Force investigators completed a probation search at a residence in the 1500 block of E. Benmore Lane. Nearly 600 pounds of commercially manufactured dangerous fireworks were seized, along with almost 10 pounds of commercially manufactured “Safe and Sane” fireworks. The dangerous fireworks included mortars, bottle rockets, roman candles, fire crackers and rocket stands. Anaheim Fire & Rescue fire investigators, as well as investigators from the Orange County Sheriff’s Department Bomb Squad, responded to assist. The fireworks were removed by the bomb squad. Two brothers, a 32year-old and a 27year-old, told police they purchased the dangerous fireworks in Pahrump, Nev., and were selling them in the local community. Detectives will present a criminal case to the Orange County District Attorney’s Office in the near future. 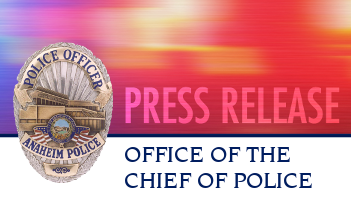 Joint fireworks enforcement teams consisting of personnel from Anaheim Police, Anaheim Fire & Rescue, and Anaheim Code Enforcement officers will be conducting heavy enforcement of Anaheim’s firework regulations through the holiday. In addition to potential criminal prosecution, violators may face civil fines of up to $3000 for possessing illegal dangerous fireworks, and up to $1000 for misuse of Safe and Sane fireworks. 2016 marks the second year in which Safe and Sane fireworks are allowed in Anaheim in very limited circumstances. Fireworks may be purchased at two locations in Anaheim beginning on June 28 through July 4 at Honda Center, 2695 E. Katella Ave., and at the Brookhurst Shopping Center, 2297 W. Ball Road. Safe and Sane fireworks may be used in Anaheim ONLY on July 4 between 10 a.m. and 10 p.m., and only in designated areas. For more information residents are encouraged to visit www.anaheim.net/fireworks. We encourage everyone to enjoy the celebration of our nation’s independence, but urge residents and visitors to Celebrate with Care.